If you are looking for your daily dose of badassery, we’ve got you covered! Or rather, photographer Akasha Rabut has. 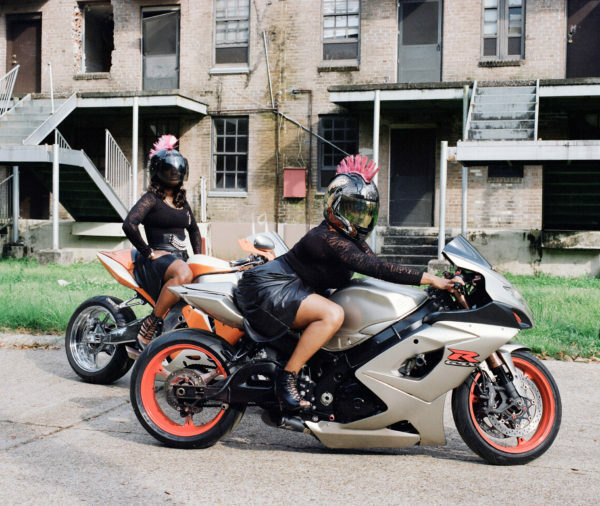 Akasha has worked for clients such as J. Cole, Nike and Budweiser, but it is her photo series documenting New Orleans’ first all-female motorcycle crew that has us hooked on her creative skills. Akasha has been based in New Orleans since 2009 and quickly became fascinated with the city’s culture and traditions. She began photographing parades, parties and second lines (which is a type of parade). It was while photographing a second line in 2013 that she first learned about The Caramel Curves. “I saw two women sitting on motorcycles. I approached them and asked them if I could take their photograph. They introduced themselves as Tru and Love. They told me about their club and invited me to a meeting at one of the member’s salons. After going to the meeting I was incredibly intrigued and decided that I needed to make a documentary project about them,” Akasha told us in an interview. 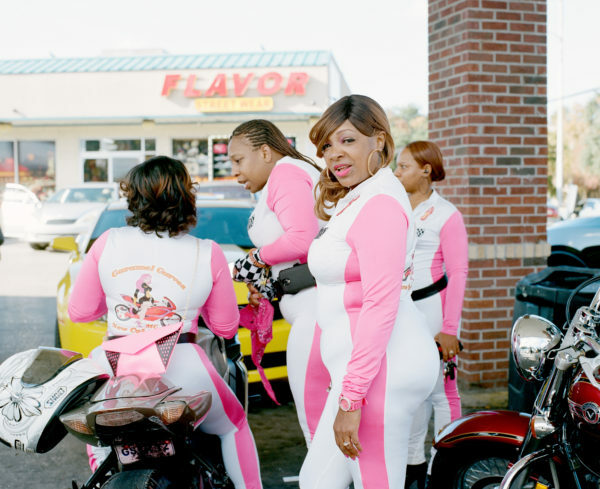 The Caramel Curves isn’t your typical biker gang. They formed in 2005 by leader Caramel, as the group was originally intended as a counterpart to a male biker crew. Their formation happened right before Hurricane Katrina, and that disaster ended the club due to the devastating displacement that happened after the storm. But that wasn’t the end of this crew. “In 2011 six original members reunited and brought the gang back together. The group crossed a boundary in the motorcycle world, which is predominantly male and white,” said Akasha. In the current climate of Trump’s America where racial tensions and violence toward minorities has become exacerbated, it should be noted that these fierce black women have been occupying space in a male-dominated environment for many years. They understand opposition, but also know how powerful their presence is in the world. “They are under constant threat and scrutiny because they are black women. Today the club is 28 members deep and the women come from all walks of life, varying from strippers to doctors. The group is a sisterhood. They encourage each other to work on their own bikes and be independent,” said Akasha. In an interview with The Huffington Post about her photo series, Akasha says she is fascinated by their brand of feminism and femininity that the Curves bring. “These women are comfortable riding their bikes in heels and love to emphasize that they can do anything a man can do, only better and in heels. I think they do a really good job at combating the stereotype that biking is a masculine hobby,” she said. 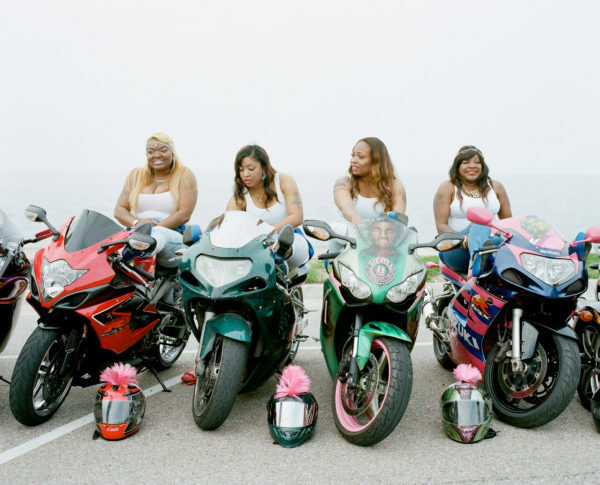 Aside from enjoying the thrill of riding bikes and busting stereotypes, The Caramel Curves are on a mission to push the boundaries of race and gender roles, says Akasha. They also give back to their community with toy drives and throwing fundraisers for women in need. During her time spent in the “Big Easy”, Akasha has come to appreciate the array of cultural intersections that exist in this city, and has been using her camera as a way to deeper explore how these cultures and people are an integral part of New Orleans history. “New Orleans has a myriad of street-parading traditions that merge age groups, communities and neighborhoods. They also serve as an opportunity for social groups to manifest their best versions of themselves (see Mardi Gras Indians and their ‘prettiest’ suits). The city’s Caribbean roots combined with it’s limitless DIY mentality has fostered a pathway for individuals who congregate around the preservation and development of unique traditions, celebrating a way of life that is found in no other American city,” she explained. Her images of The Caramel Curves have brought some wider media attention to the New Orleans culture, and she was asked to direct a short film about the group for Vice’s Broadly channel. The juxtaposition of these black women going beyond stereotypical societal ideals and forming a unique identity in an environment that is heavily geared toward men, is exactly the kind of intersection Akasha likes to find herself in with her photography. “My work is concerned with capturing the relationship between the geographic and architectural structure of New Orleans in relationship to the culture that struggles and thrives with in it. Constantly in a battle against poverty, structural inequities and ongoing threats of violence, New Orleanians vigorously and vibrantly seek opportunities to represent and preserve the cultural uniqueness that stands in contrast to the struggle,” she said. You can see more of Akasha’s work on her website, and get to know The Caramel Curves by following them on Facebook. We’ve shared some of our favorite images from Akasha’s series throughout this post, with her permission.